Maybe some people don’t see the opportunities of using physical mail, but they weren’t among the approximate 3,500 attendees at the National Postal Forum (NPF) last week in Anaheim, California. Whether it was vendors in the exhibit hall or presentations in the classrooms, people were bullish about the benefits and the future of physical mail. And leading the charge was the Postmaster General (PMG), Megan Brennan. For the last several years, the principal message from the leadership of the United States Postal Service (USPS) centered on the gloomy outlook for mail volumes, the fiscal crisis created by Congress and the need to reduce mail service to 5-days-a-week delivery. That was not the case this year. PMG Brennan and her team focused on the positive side of the narrative, emphasizing that physical mail is complementary to electronic communication. Bridge the physical and digital world through the mailpiece – for example, using a QR Code to launch an augmented reality experience on a tablet or mobile device. Or, using “Real Mail Notification”, with mailpiece scans upon delivery to the mailbox, triggering an additional digital interaction. A test of this methodology in Northern Virginia showed a 10-fold increase in response rates. Greater transparency through the Intelligent Mail Barcode (IMb) and Intelligent Mail Parcel Barcode (IMpb). The data collected and shared with mailers creates a predictive delivery window. This may transform into a mobile application that notifies consumers when mail arrives. Hyper-personalized mail. Harnessing the power of big data, visibility and analytics, marketers can create powerful messages that maximize the “mail moment." Explain what is new with mail. Encourage their companies to take a long-term data and technology strategy with mail. Experiment with mailings that test the new technologies. Attendees appreciated the frank discussion. And will continue to watch their mailstreams for the promised improvements. There seemed to be an increased participation in the educational sessions. Whether the classes started at 9:00am or 3:00pm, the rooms were filled (over 200 people came to my class on “Quality Control in Mail Operations”!). The new “Executive Leadership” track included many respected industry leaders, including Marianne Gage, President & CEO of Cathedral Corporation; Karen McCormick, Mailing Industry Project Manager at the National Postal Museum; and Debbie Pfeiffer, President of Pitney Bowes Presort. It was beneficial to hear from people running companies and leading innovative ventures. There was a lot of interest surrounding the Mailer Scorecard. In addition to providing feedback to mailers on the quality of the mail they submit, the Scorecard will be a method for the USPS to invoice mailers who don’t meet the required performance thresholds. Whether a company uses an in-plant operation or outsources to a mail service provider, the Mailer Scorecard will have an impact on your postage costs. On a personal note, I took part in the Habitat for Humanity build that took place on the Saturday before the conference started. 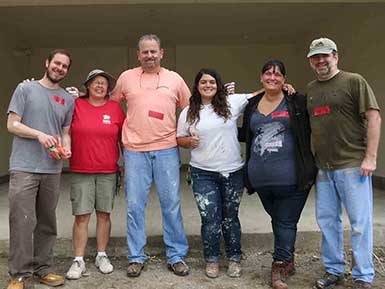 Sponsored by the NPF, volunteers from California, Illinois, Nebraska and Massachusetts helped prepare, paint and clean two duplexes. It was rewarding to be part of a worthwhile effort that gave back to the local community. We also hosted the 15th Annual Friends of The Berkshire Company dinner – a gathering of clients and friends to celebrate the past, and look forward to the future. An important reminder of the people who make our business possible. 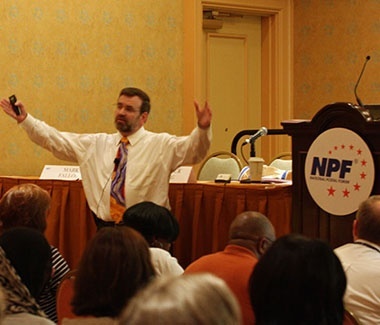 We’re looking forward to next year’s NPF in Nashville!